As a consultant this week sought direction from the Sarasota County Commission about how to prioritize parks projects over the next five years — given anticipated funding limitations — Commissioner Christine Robinson had a succinct suggestion. She first asked Dave Barth to go back to one of the slides he had shown the board just moments earlier, during his Feb. 9 presentation. It contained the mission statement for the county’s Parks, Recreation and Natural Resources Department. “I think you use [that] to determine your priorities,” she told him. “I like it,” Barth replied. 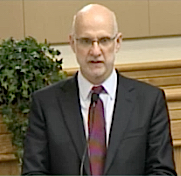 Barth’s appearance before the board this week was another step in the process of creating a new master plan for the Parks Department. In February 2015, the commission unanimously approved a $299,800 contract with Toole Design Group, which has an office in Orlando, to develop the document. Barth, who has his own consulting firm in Gainesville, has been working with the county on behalf of Toole. 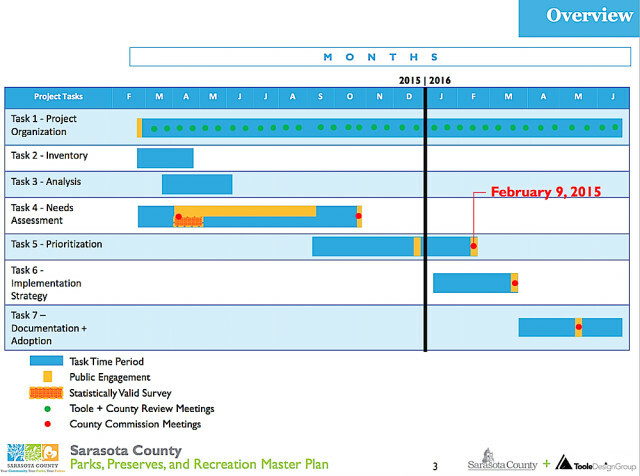 Development of the master plan began in February 2014; it is expected to be completed in June, the memo notes. Barth told the board that he and county staff are working with the Cities of North Port and Venice as they undertake master planning for their parks, as well. In workshops undertaken as part of the process, Barth explained, he and county staff members have heard much discussion about people’s desire for the county to be more responsive to their needs in regard to parks. In advance of this latest update to the commission, Brown’s memo also notes that a total of 44 people attended two open houses held in December 2015 to discuss fitness and exercise options, following a survey undertaken on that topic. “The most frequent suggestions were to add … trails, outdoor fitness equipment along trails and to increase beach and water access,” the memo says. 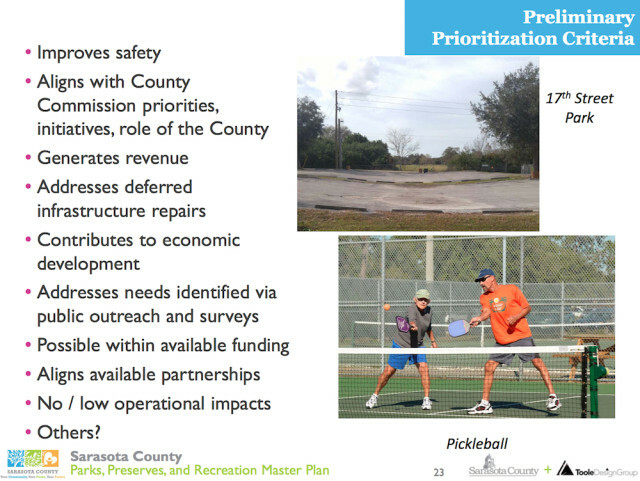 Other comments called for more pickleball courts and reorganizing athletic fields so each serves a single sport, making the facilities better locations for tournaments, the memo adds. On Feb. 9, Barth told the board that, based on his discussions with County Administrator Tom Harmer and staff in the county’s Office of Financial Planning, revenue that could be allocated to parks projects is expected to be flat over the next five or six years. Therefore, he said, he needed the board’s direction on priorities. The common goals he and staff identified as they worked on seven sub-systems representing different facets within the department are for the county to make as many repairs as possible to existing facilities and then to provide new amenities as opportunities present themselves. Those subsets were as follows: athletics, beaches, natural areas, parks, recreation centers and programs, trails, and water access. 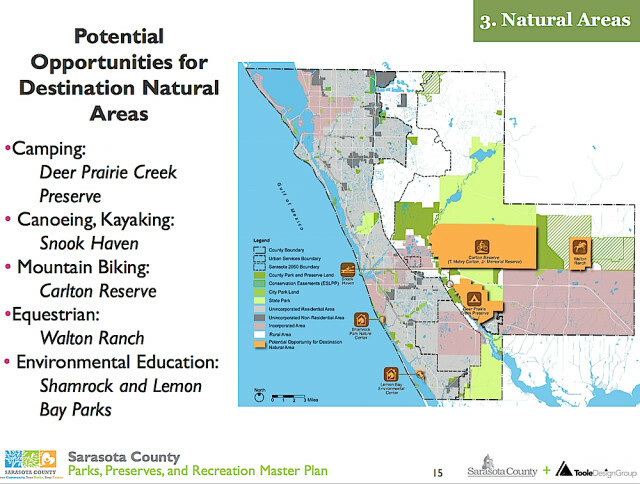 Then Barth showed the board a slide with several suggestions for criteria that could be considered in determining how to allocate funding to a certain park or preserve. Among the considerations were whether a project would improve safety features of a facility, contribute to economic development, generate revenue, address needs identified through public outreach or deal with deferred infrastructure repairs. In response to a question from Robinson, he explained, for example, that if users of a specific park pay for activities there, that income could cover operations and maintenance. “Is revenue generation an important criteria for you?” Barth asked. Making that an important element in the decision-making process seems likely to “throw us off of our mission,” Robinson told him, though she said she would not ignore the financial factor. Mason also concurred with Robinson’s proposal of the mission statement as the focus for priorities. At that point, County Administrator Harmer brought up an issue he said Barth had discussed with him in a one-on-one session. Barth had noted that he “felt like the way we do parks here is a little bit different than the other counties that [he] typically [works] with.” Other counties have more of a regional focus, Harmer added. With no formal vote needed, and apparent consensus on Robinson’s suggestion, Barth concluded his presentation.